With the desire to help their customers maximize and expand their existing investments with ample time for future planning, JD Edwards has announced the extension of their premier support. Their change to a Continuous Innovation Delivery model and customer input sparked this change, as Oracle wanted to reassure customers that upgrading JD Edwards platforms would not result in a shortened window of premier support. The extension of premier support will hopefully help customers capitalize on the vast JD Edwards system enhancements, resulting in an improved business system for your company. 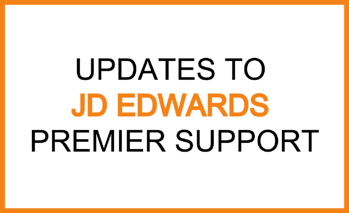 JD Edwards released the extension dates for the premier support function giving customers plenty of time to adjust to the updates and enhancements. For JD Edwards EnterpriseOne 9.2, Premier Support is effective through at least December 2030, and for JD Edwards World A9.4, Premier Support is effective through at least April 2022 and Extended Support through at least April 2025. World A9.4 support is significantly shorter than EnterpriseOne based upon customer feedback. JD Edwards explained that most customers are looking to migrate systems, therefore they wanted to further extend EnterpriseOne support so they could give customers the chance to migrate without the fear of no help. Continuous Innovation Delivery is the process of producing new software in short cycles. With the eCommerce world constantly changing, the need for rapid updates and new technology is imperative. JD Edwards' implementation of Continuous Delivery will result in their ability to service their customers in a more efficient and effective way. Continuous delivery allows for the release of improved developments two to three times a year for EnterpriseOne and as needed for World, as opposed to making customers wait years for one major release. This new process will shorten time-to-value cycles while increasing business control over updates. Due to the shift to a Continuous Delivery model, JD Edwards no longer plans to release major EnterpriseOne releases. Instead, JD Edwards is providing continuous enhancements through their software packaging and delivery processing updates, thus letting your business pick and choose the enhancements that best fit your wishes. Furthermore, JD Edwards does not plan to release a major Enterprise One release unless there is a significant functional or technological change. The company shares that enhancements and upgrades, instead of completely new releases, will result in a cost reduction and the elimination of disruption associated with major upgrades. Oracle plans to deliver JD Edwards enhancements regularly, along with maintenance, regulatory updates, and technology improvements. Delivering smaller more frequent updates will make them routine and predictable thus making the use of new updates more user-friendly and stress-free to implement. JD Edwards is excited to provide their customers with continuous support and reassurance. Through extending Premier Support they hope to aid the migration and update of platforms as well as reduce the worry and stress associated with new releases. Do you need help updating or managing your JD Edwards environment? Contact our team.